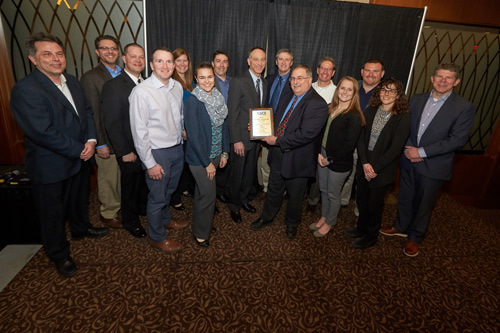 The Onondaga Lake cleanup team has received the 2018 Outstanding Civil Engineering Achievement Award from the Syracuse section of the American Society of Civil Engineers (ASCE). The award recognizes the team’s “superior civil engineering skills” and “significant contribution to civil engineering progress and society.” The team, led by Honeywell, includes Parsons, OBG, Anchor QEA, and Sevenson Environmental Services. Onondaga Lake cleanup team representatives accept the 2018 Outstanding Civil Engineering Achievement Award from the Syracuse section of the American Society of Civil Engineers. Recognized as one of the largest lake restoration projects in North America, the Onondaga Lake cleanup is the result of more than two decades and millions of hours of intensive effort. The project was completed through an unwavering focus on sound science, technical excellence, community engagement, and sustainable practices, as well as a commitment to health and safety. Project innovations resulted in significant advancements in sediment remediation technology. The cleanup combined innovative dredging and capping designs with long-term habitat restoration, leading to an environmentally protective solution. As part of the Onondaga Lake cleanup, Honeywell has restored about 90 acres of wetlands, and about 1.1 million native plants are being planted. The restored wetlands have become home to more than 250 wildlife species. Onondaga Lake western shoreline before (left) and after (right) the cleanup. Honeywell completed dredging in November 2014, a year ahead of schedule. About 2.2 million cubic yards of material was removed from the bottom of the lake using hydraulic dredges. Onondaga Lake capping was completed in December 2016. Habitat restoration, a major focus of the cleanup, was completed in 2017.